I’ve been an avid fan of Pinterest and if you don’t what that is, you’re missing out! I wouldn’t even know where to start on how to explain what Pinterest is other than it’s an amazing website. They have arts & craft ideas I would’ve never ever thought of, wedding ideas, recipes, holiday decor, home decor, fashion, beauty, destinations, and just a whole bunch of great stuff. Anyways, I’ve been liking and reposting a lot things on Pinterest and have finally got down to trying some of the projects I liked. So last week I decided to do my first Pinterest project, which was turning my unused curling iron into a curling wand. I’ve always wanted a curling wand but I wasn’t really trying to spend a lot of £££ just to curl my hair. So when I saw how to make one myself, I was ecstatic! It was really easy to do and all you need is a screw driver and 5 minutes of your time. Also I’ve included step by step instructions as well as pictures for those who want to try this. 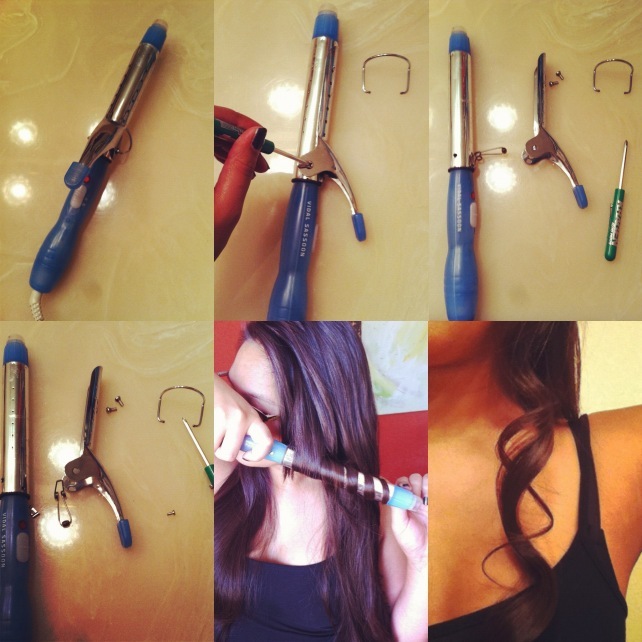 1) unhook the curling iron stand by simply pulling it apart and it should pop right off. 4) then plug it in and enjoy your new curling wand, tada! The best part is that it works just as good as buying the expensive ones but without spending a penny!